There were a few key principles behind the design of TapCellar and I think these are what set the app apart from most other beer apps I've used. It had to work well with one hand because the other hand has a pint of beer in it. The app needed to work as well offline as it did on WiFi because good bars often have terrible reception. The data needed to be private and not require a social network. I like social drinking but I don't like being a statistic. The app had to be fast for journaling and scoring beers because spouses hate iPhones at the table when we should be enjoying a good beer with them. Beers should be organized in useful and customizable ways. Maybe it's just because I made an app that fits how my friends and I enjoy craft beer, but I really like how TapCellar turned out. It lets me keep track of my opinions through grades and journal entries and track my cellar and shopping lists. It also gives me quick access to powerful search and filter options to dig down and find that one great beer I want to recommend to a friend. To make the app work even in the most remote trendy beer bars, we store over 33,000 beers offline in the app. It's not just what you've scored but everything available on BreweryDB. TapCellar has an optional background sync with BreweryDB (on by default). It's not aggressive and it's designed for low bandwidth. 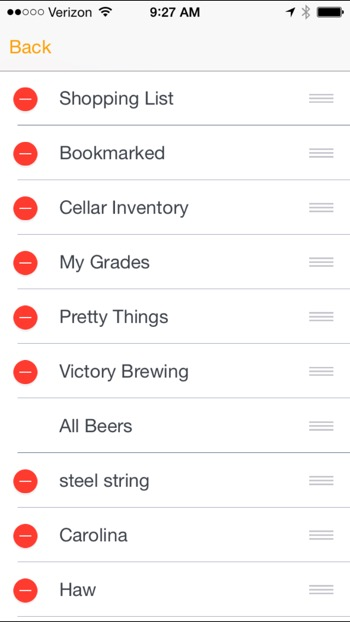 TapCellar checks for updates on BreweryDB once a day and also sends newly created beers and edits from your phone. As I mentioned in the privacy section, it's just the bare minimum to describe a beer. TapCellar is backed by the amazingly high quality data of BreweryDB.com which acts as a caretaker of the canonical beer information. Every beer and brewery added to their data goes through a review and cleanup. We liked this about the service. TapCellar comes with over 33,000 beers but also includes an option to stay up to date with BreweryDB. We chose a quid pro quo model. If you want daily updates, then you agree to send your beer details (not your journal entries or photos) back to BreweryDB. This way everyone benefits the same amount. But we also think it's important to make the data portable. TapCellar will export all of your user data as a single zip file. The backup contains all of the details, grades and photos necessary to recreate your TapCellar records. Just open the backup file in TapCellar on iOS and it will merge the records into the new install or your nighttime iPhone. There should be no reason to set down your beer to check in. 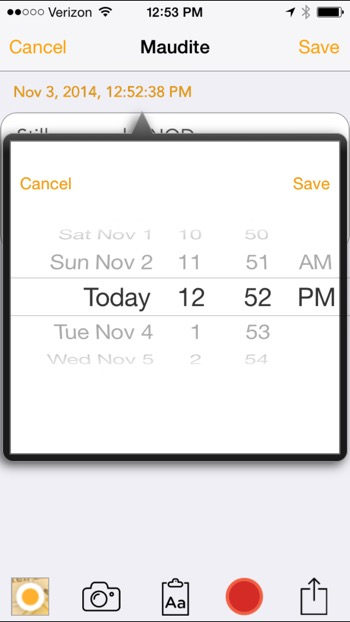 We use sloppy swipe and easily accessed controls everywhere. Swipe right to left on a beer in the list to access the swipe menu. 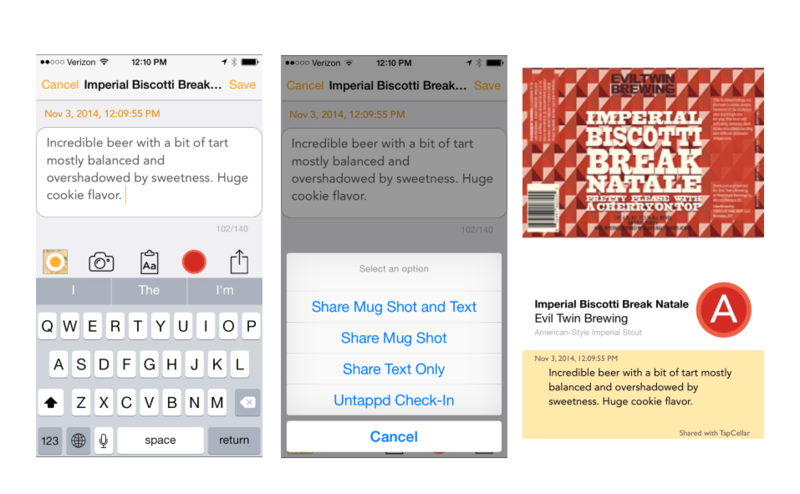 With the swipe menu you can quickly add a journal entry, mark a beer with a bookmark, add it to your shopping list or change your inventory. Tap and hold on a beer in the list to copy information about it as plain text. You can grade a beer on almost every screen without entering an edit mode. 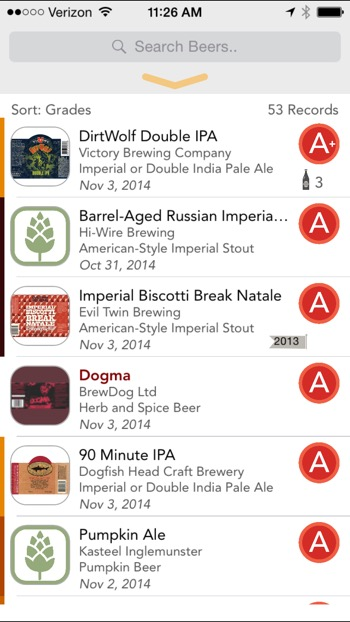 We took a different approach to rating beers, partly because TapCellar isn't a social stream. 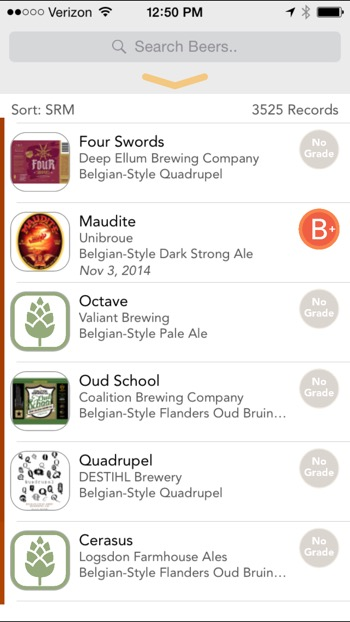 You can rate (we call it grading) a beer any time in TapCellar. We make it easy to change your mind, in fact we encourage it. 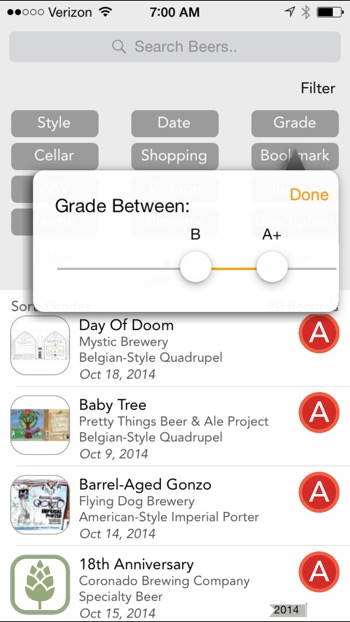 Grading is as easy as tap and slide in TapCellar. 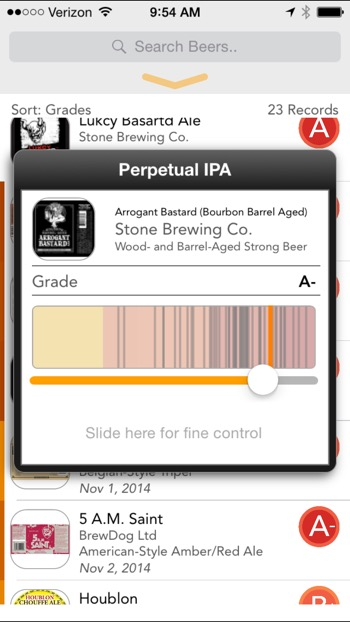 While moving the thumb slider you'll see all of your previously graded beers. As the grade picker moves past a previous grade, TapCellar shows some of the details about that beer to give you a brief reminder about days gone by. For me, this really changed how I scored. Just the little reminders helped me prioritize beers. Over time, my grades started to spread out a bit more, mostly because I just didn't remember what I thought about various grades. I like to think of myself as a data nut. I like slicing and dicing data I collect as much as capturing it. So having access to a huge collection of beer information means I can do some fun stuff. TapCellar provides a variety of user editable filters in addition to a global search box. Global search looks at the beer and brewery names but the filters let me dig deeper and make sense out of it all. All of these filters can be combined and also used with the global search. We also added a few different ways to sort the beer list. 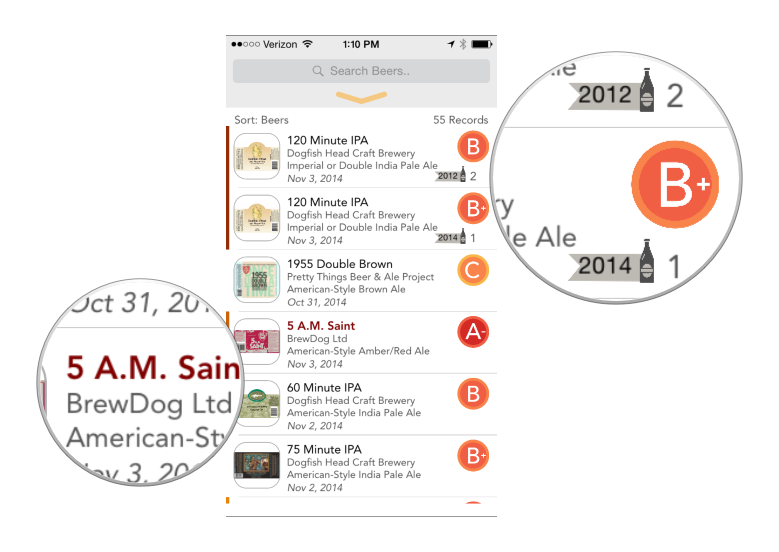 You can combine multiple filters with a single sort and then save the combination as a view into the beer list. It works across all of the data you have, not just your own check-ins. This is my favorite aspect of TapCellar. I create a lot of saved filters. Before I go to a brewery, I create a saved filter so I can quickly see what they make and journal what I drink. Journaling provides a really powerful way to create filters based on text search. You get unlimited numbers of journal entries for each beer so I add journal entries just to tag a beer with a specific trip. For example, when I go on vacation, I pop in a journal entry with a some easily identifiable text.2 Then I can create a filter that shows me everything I drank, sorted by date. I also use journal tags to prepare for beer festivals. I can browse a list of beers and add a journal entry without grading the beer. I just add the festival's name as a searchable text. Then I can quickly open the list when I arrive and I have immediate access for grading. You can save the filter with a name that makes sense to you. 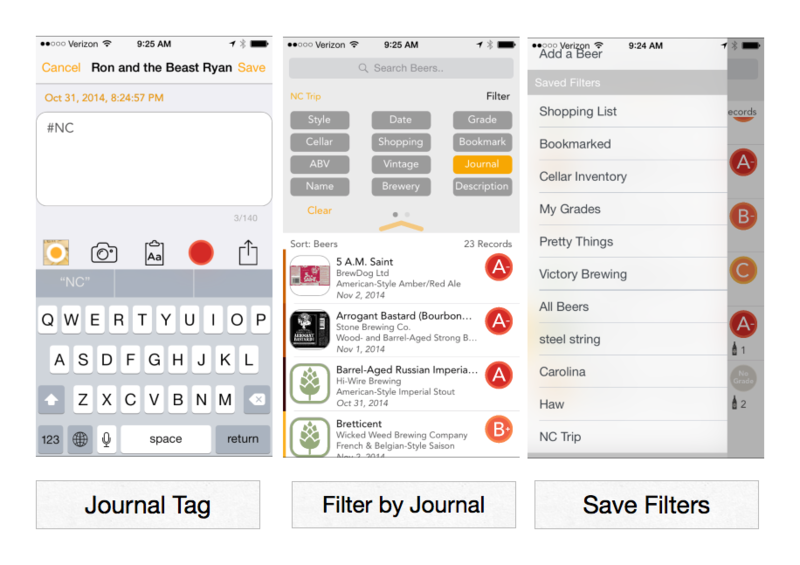 TapCellar also makes it easy to organize and clear filters that you don't need anymore. We start you off with some basic filters we figure most people will want, like your graded beers and cellar inventory, but we also added in a couple of our favorite local breweries because we think craft beer is partly about helping each other out. We tried to sweat the small stuff for the first version of TapCellar and there are a bunch of features I think are pretty neat. For example, if there's color SRM value set for a beer, we show it on the left side of the beer list. This really gets useful when your looking at a list of Belgian beers and want something on the dark side. You can edit the location and time stamp of a journal entry after it's created. Sometimes things are just too fun to stop and journal while I'm drinking a beer. This lets me fix it later and still get it all right. 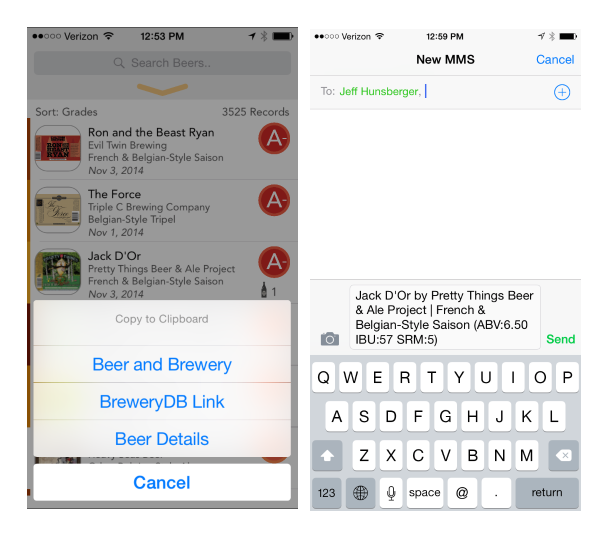 You can tap and hold on a beer in the list view to copy info about the beer as plain text. We've added a bunch of visual cues throughout the app. If you bookmark a beer, we tint the beer name as a subtle hint while scrolling. If you have an inventory of a beer, we add the count on the beer list. We also track vintages for beers and display them right in the list view. 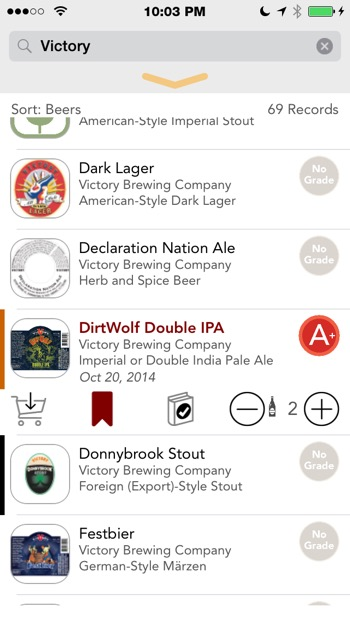 If you like craft beer then I think we made a pretty great app for your general use. The circles I run in all appreciate the privacy stuff and the offline support. I know I do. But I'm also just really happy to make something that people seem to like. Most of what I do online, I put out for free. But TapCellar is something that was pretty expensive to make and it's something that I want to continue to develop. We've tried to cram a lot into the first version but there's a lot more we want to add. So this is the first thing I'm making that I put a price tag on. TapCellar is available on the App Store right now for $5. We have a lot more information on our Web site. You can also follow the app on Twitter where we show off some of the better beers we're enjoying. If you want to hear Jeff and I geek out about releasing the app, check out the special episode of Nerds on Draft podcast.